The Vienna Symphonic Library has announced the release of Vienna Instruments PRO, a new powerful sample player. • Human Performance Control for adjusting the timing and intonation of your virtual musicians. • Super-fast loading times, even after cold starting. Load progress bar. You can even play the sounds while the sample patches are still loading! • New GUI design: Basic View for an easy overview. Advanced View displays all of the important parameters in the same window. • Tuning scales: You can even switch scales using controllers while you're playing, e.g., from just intonation to an Arabic scale, or use your own scales. Time stretching – works great on, e.g., staccatos, runs, crescendos etc. • Built-in reverb (algorithmic for low latency). • New options for switching articulations, e.g., sequence map and interval map. • Slot rack for up to 8 articulations per cell with volume slider and power panning for each patch. Stack your own powerful multi-instruments using auto voicing. • Separate volume control and EQ for each matrix. • Many options to customize your patches and articulations for your personal work-flow. • New browser with search function. • Keyboard display with 128 keys, showing all key switches, with adjustable volume zones and instrument ranges for stacked instruments. 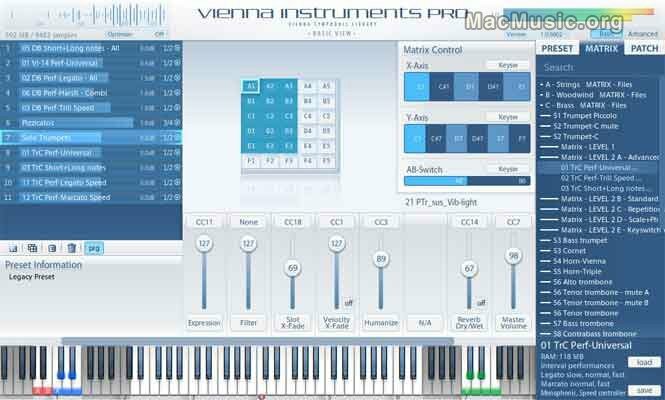 Vienna Instruments PRO is available at a price of €125. Introductory Offer Users who purchase Vienna Instruments PRO through September 15, 2010, will receive the all-new Flugelhorn for free.